The recent spate of national reports criticizing both undergraduate and graduate education (National Endowment 1984; National Institute 1984; Association of American College 1985) has focused on a number of specific educational deficiencies, including an excessive narrowing a the discipline level, insufficient emphasis on academic research and scholarship, and an overemphasis on encyclopedic knowledge. Such criticisms have generated numerous efforts at program improvements by campus officials (Hawley 1989; Klemm 1988). Unfortunately, a dearth of knowledge about the fundamental educational processes of graduate programs has been a serious constraint on efforts to decide which of the numerous improvements will actually enhance student performance in graduate education. 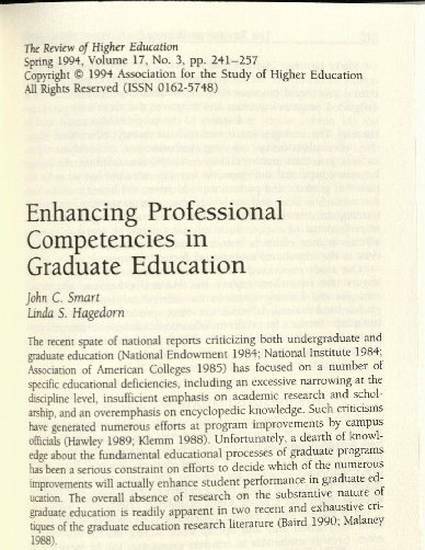 The overall absence of research on the substantive nature of graduate education is readily apparent in two recent and exhaustive critiques of the graduate education research literature (Baird 1990; Malaney 1988).